Director Bryan Singer joined the social networking site Instagram today, with his first photo teasing the treatment for X-Men: Apocalypse. He is working on the screenplay with Dan Harris and Michael Dougherty. While there is not a whole lot of information revealed in by this image, there is mention of The Four Horsemen. Take a look at the photo, then read on for more details. The Four Horsemen were teased in the end credits scene of X-Men: Days of Future Past, where fans caught their first glimpse at a young En Sbah Nur, a.k.a. Apocalypse, building the pyramids in Egypt through his telekinetic powers. The Four Horsemen - War, Pestilence, Famine, and Death - were featured in the background on horseback. The photo does reveal that this prologue battle scene takes place along the Nile River, although it isn't known when exactly this sequence takes place. 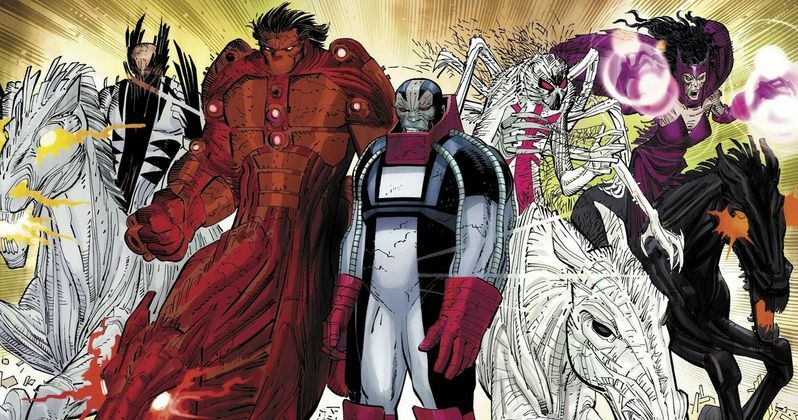 In the Marvel Comics, there were several different iterations of The Four Horsemen, who serve as Apocalypse's personal guards and primary henchmen. Members of The Four Horsemen included Wolverine, Angel, Hulk, Gambit, Sunfire and Polaris, but it is not known which version of The Four Horsemen will appear in X-Men: Apocalypse. While it's possible that Channing Tatum, who was confirmed to play Gambit last month, will appear as one of the Horsemen, it doesn't seem likely, following the actor's comments earlier this month that 20th Century Fox may make a Gambit stand-alone movie before bringing him into the X-Men universe. Are you excited to see which version of The Four Horsemen will debut on the big screen in X-Men: Apocalypse? Chime in with your thoughts below.